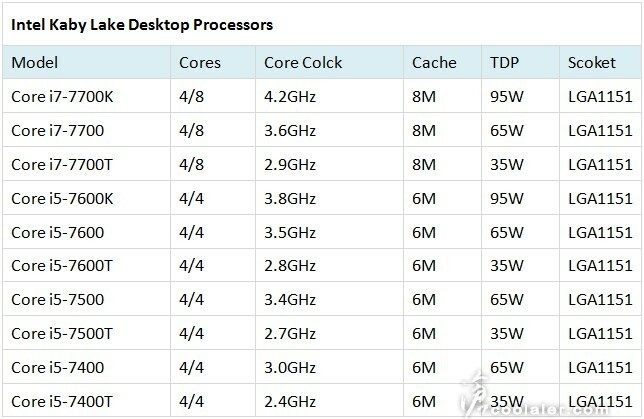 As you can see Intel sticks to its well-known CPU practices – Core i7 chips get four cores plus Hyper-Threading and 8 MB of L3 cache and Core i5 get four cores with no Hyper-Threading and 6 MB of L3 cache. There will also be some low power models with TDP of 35W and lower clock speeds. Speaking of this Kaby Lake seems to enjoy a clock speed increase per chip of 100-200 MHz, which is nice. The chips will also use the current LGA 1151 socket, so some users will not need to get a new motherboard. The Kaby Lake generation will be accompanied by a new Intel Z200 chipset series. We now know that there will be a few chipsets in this line – Z270, H270, Q270, Q250 and B250. There’s no more information on them as of now.